The GoPro app makes your smartphone an extension of your GoPro camera, despite tagging along some bugs. For a GoPro user, every part of life is an adventure. 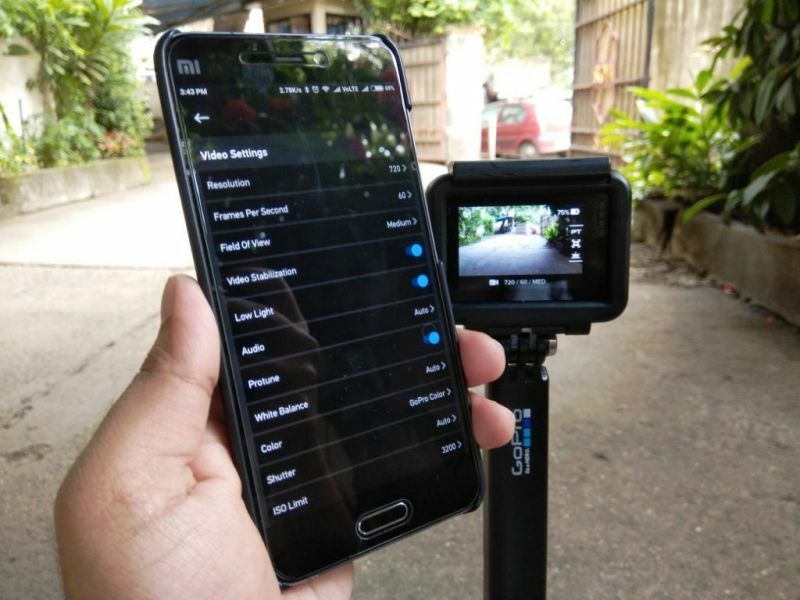 Recording simple and mundane things such as walking on a pavement or riding a bike is a valuable material for them to create an interesting video and share it to the world. GoPro always wants to enhance the experience of using its cameras for its users, which is why it makes a number of accessories such as tripods, drones, mounts and a lot more. The latest addition to this list is the newly designed GoPro app for Android and iOS. 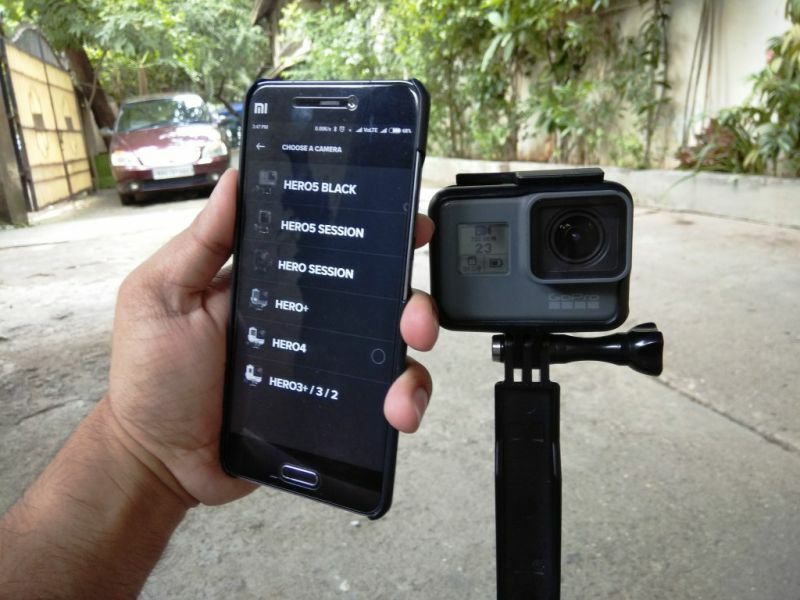 The app is meant to supplement the GoPro cameras, especially the GoPro HERO5 Black (review). 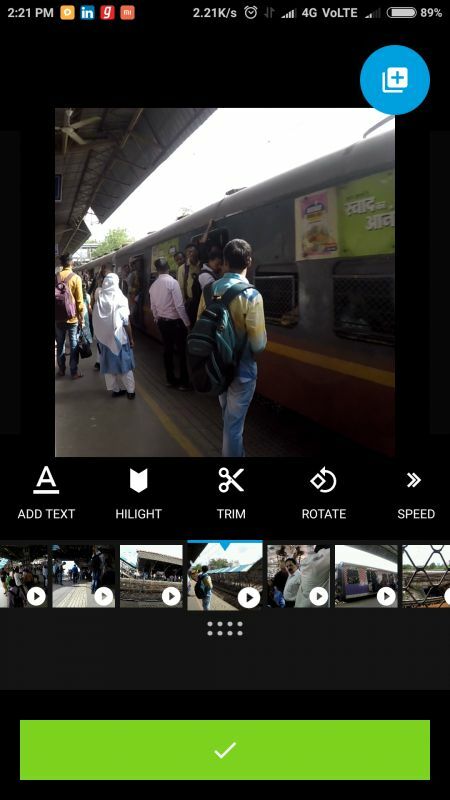 The app was earlier known as Capture, but now is called GoPro, which works in conjunction with its other video editing app, Quik. On a GoPro camera, you are stuck with the tiny, touch-based display for controlling all the necessary parameters of the camera’s settings. With the GoPro app, you can do all of that on your smartphone’s bigger display. 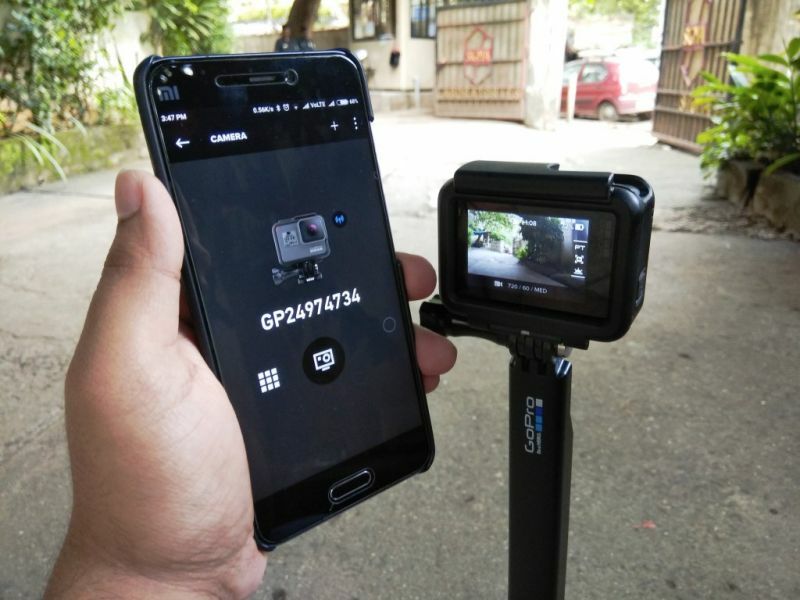 On an Android, you need to simply launch the app and follow the on-screen instructions, which turns on the Bluetooth and Wi-Fi to seamlessly connect to the GoPro. However, on iOS devices, the steps are a tad too tedious because of the iOS’ system restrictions. However, once you are connected, you are free to begin your adventures without any more hurdles. 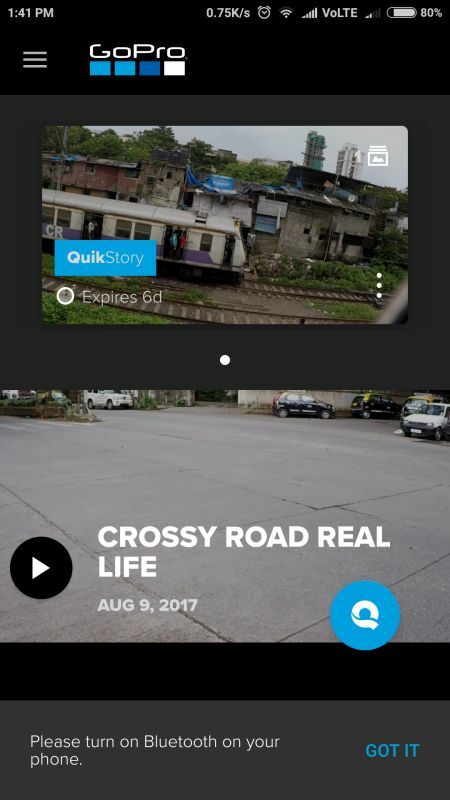 Launch the app and you will end up on the app’s home page that shows all your recent videos and ‘Quikstories’, which are short clips of your latest recordings. If you haven’t turned on your Bluetooth, you will get a reminder for the same. The home screen also shows existing short clips as well as a shortcut to the Quik app, about which we will discuss later. To connect to the camera, the user needs to open the menu and select ‘Camera’. The screen shows the GoPro device’s name along with two options — the first icon opens the gallery and the second icon pulls up the camera’s interface. The gallery option shows all the media on your camera’s storage and allows you to download them to your smartphone. On the app, click on the camera icon (in the centre) and your GoPro will start streaming it live on your smartphone’s screen. In short, your smartphone is now a viewfinder for the GoPro. To reduce the transmission delay between the camera and your smartphone, the app utilises the smartphone’s Wi-Fi interface. However, we did encounter a noticeable delay between the video feed on the camera and the app — hopefully, GoPro takes note of the same and applies some updates to fix this zone. Apart from showing the camera’s feed, the interface also shows various details such as fps, resolution, battery level and a few more. Options to choose between various video shooting modes, photo modes and time lapse are also at your fingertips. You can also put the camera on standby with the power button icon on the top of the interface. The Settings option lets you access all the camera settings such as resolution, fps, field of view (FOV), video stabilisation, white balance, shutter speeds and a lot more. In short, the app basically turns your smartphone into a controller for your GoPro camera. However, the app has its set of flaws as well. 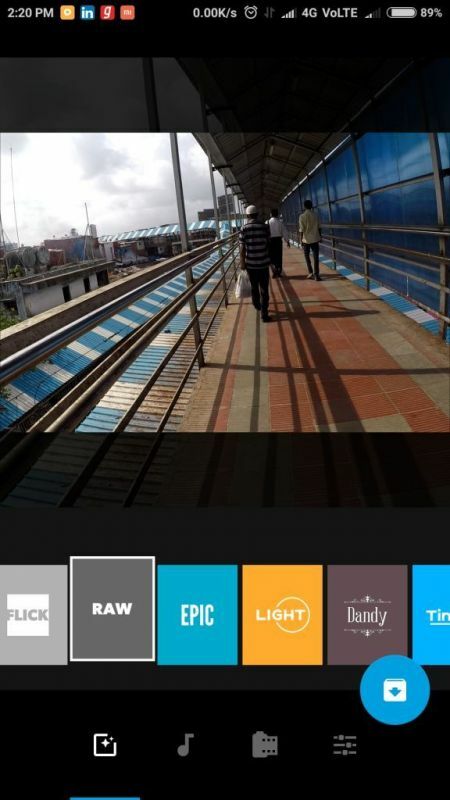 The connection between the app and the camera isn’t as reliable. 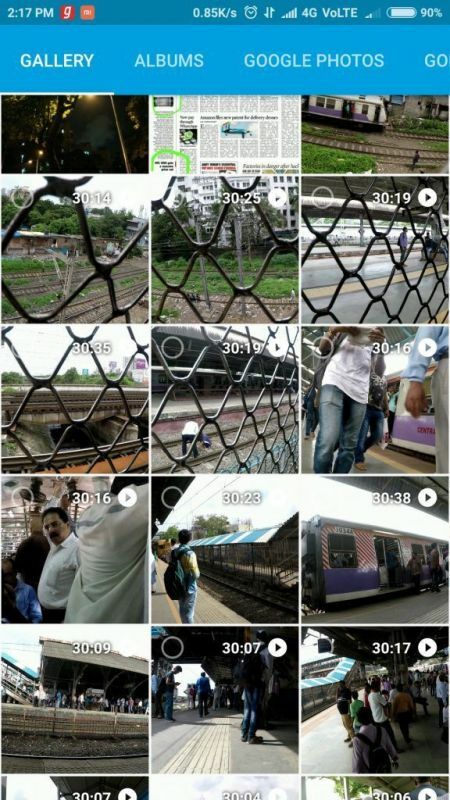 In our case, five consecutive connection attempts were required to pair the phone and the camera. This could be an issue with the smartphone too, but we are yet to confirm on this — an update will soon be included later. As for when using it on an iPhone, we encountered lesser issues than an Android. 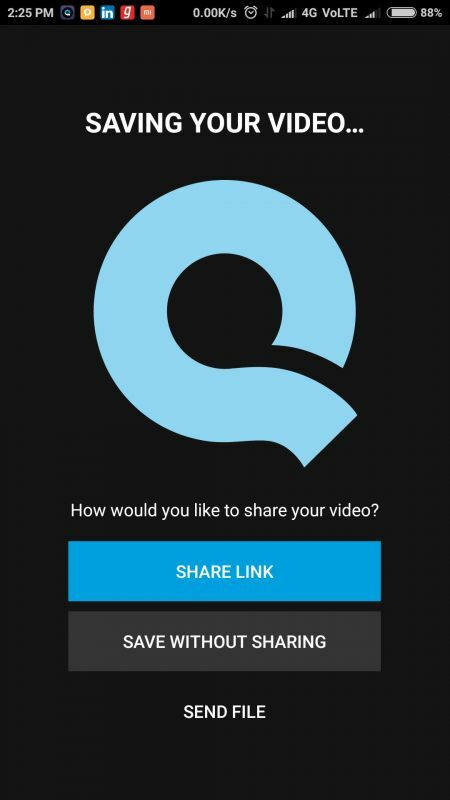 With Quik, you can select your GoPro media as well as other media from your smartphone and convert them into YouTube-ready short videos which are easy and quick to share. 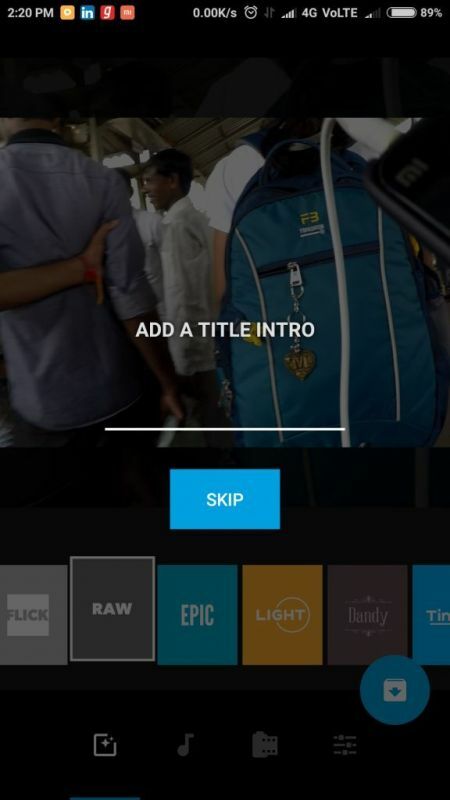 Quik has a host of pre-defined filters and themes to convert your videos into exciting clips, with audio, and share instantly on social media. Check out some of the clips we managed to create below. 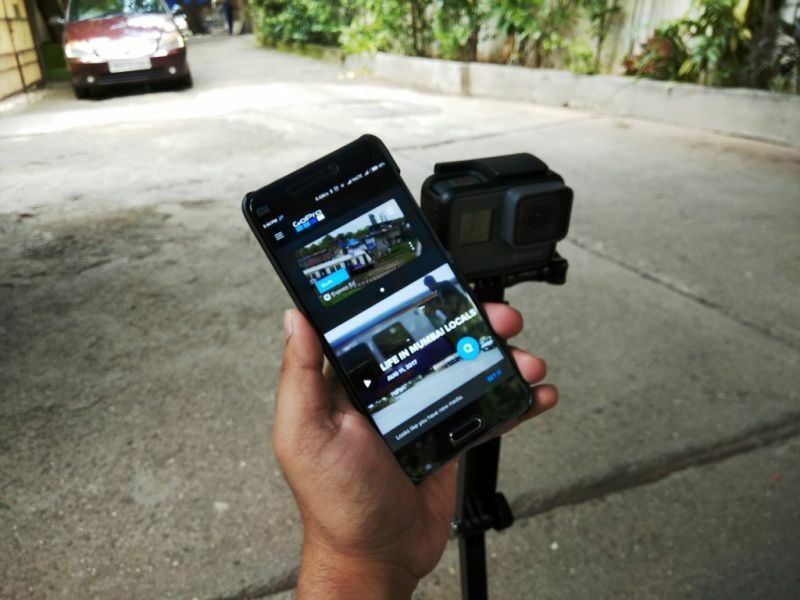 If you are interested in making such Facebook-, YouTube-, or Instagram-worthy videos, then you can easily create it using Quik, even if you don’t have a GoPro. All you have to do is select videos on your smartphone’s storage and apply filters, add text, insert audio, select a theme and compile. You can also edit individual videos and apply texts or themes to them. Once you are done with your project, you can either save it locally or share the video. The GoPro app also features something that is an important need of the hour for every GoPro user. 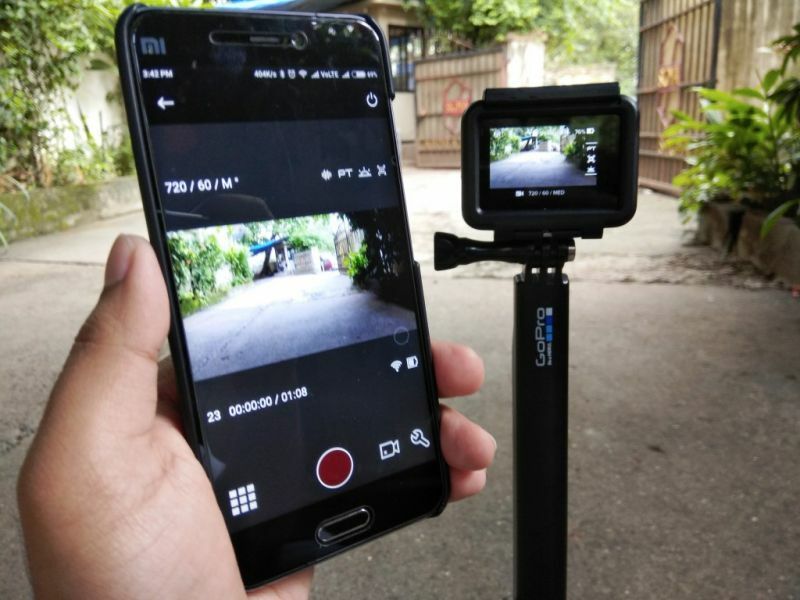 After you capture videos from your camera, you previously needed to connect your PC or smartphone and then download the videos. This caused an irritating waste of time, and you could not shoot more videos during the transfer. GoPro’s new app now allows automatic video sync between the camera and the phone. What this means is that the app when connected to the camera will start downloading the videos to the smartphone automatically when the camera is in standby or idle mode, over the wireless network. This feature comes in very handy, especially when you are constantly outdoors and don’t have time to connect cables and stuff. 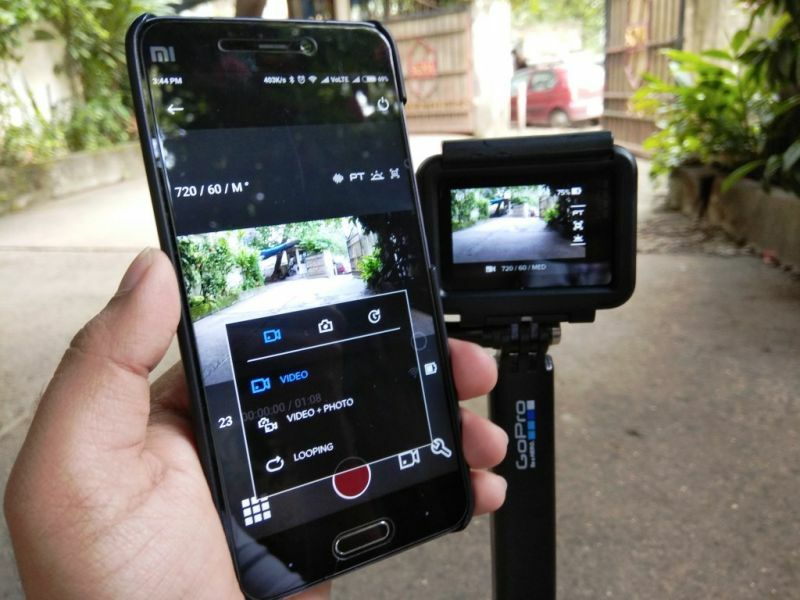 However, do note that the data transfer speeds between the camera and the smartphone will be slow if your videos are heavy — full HD to 4K videos will have a large file size and will probably fill up your smartphone storage and even run your camera and smartphone’s battery down faster than usual. This auto-sync feature is only beneficial if you are shooting videos in 720p or in certain time-lapse modes. Overall, the new GoPro app is a big step in the right direction for making GoPro utilise smartphones to its benefits. If you are using a GoPro, we suggest you download the new app and use it to your benefit. The GoPro app is available on the respective app stores for free.